Inspired By True Events - They are vampires, though. Ignore the title. They made me write that. Speaking of ignoring, ignore the re-sizing done to the Theater Bats and Baba. I decided to make them about the same size, ’cause the whole “smaller” thing was getting old. Side note: That grin may be permanently attached to Baba’s face. Or maybe she’s still thinking about Rick. 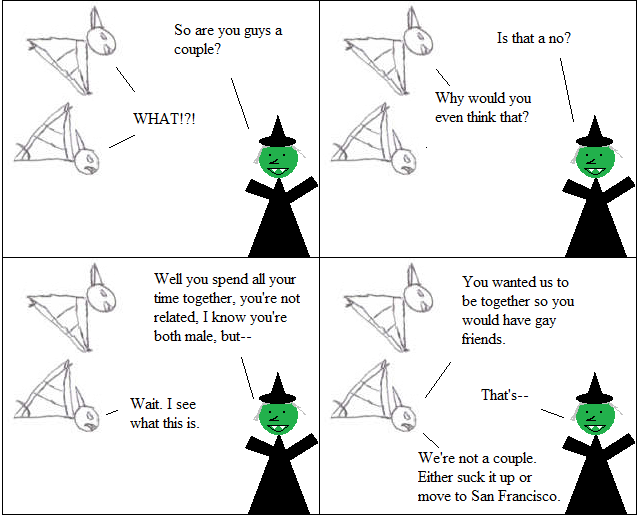 You know, bats are the mammals most likely to be homosexual…Second to humans, of course. Of course they’re a couple.